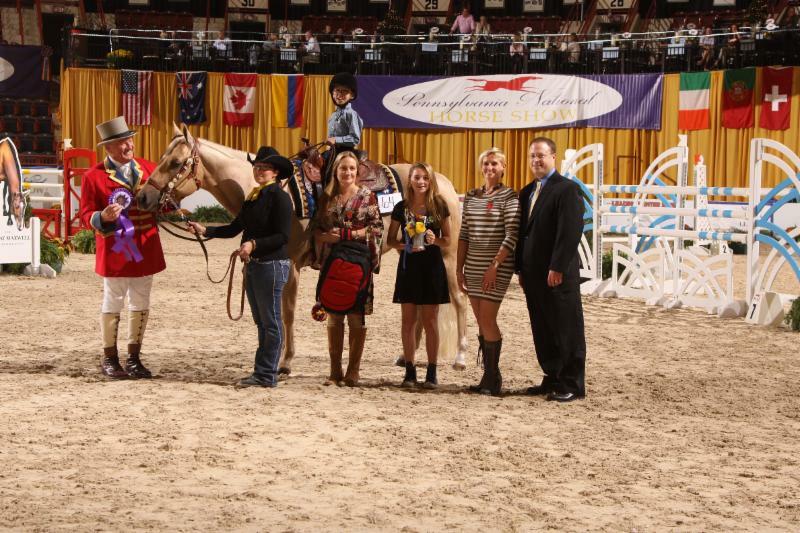 Harrisburg, PA - October 21, 2016 - Friday night, the Pennsylvania National Horse Show, presented by the Lindsey Maxwell Charitable Fund, opened the in-gate to the coliseum, and their hearts, to honor some very special horses and their riders, and one extraordinary horse, in particular, as Therapeutic Horse of the Year. 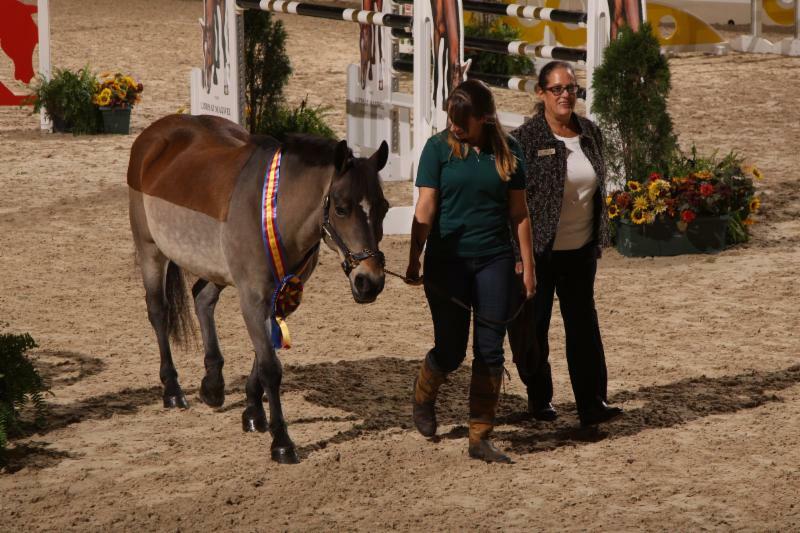 The Pennsylvania National Horse Show Foundation invited 14 riders to compete at the PNHS in the Inaugural PNHS Foundation Therapeutic Championships. The riders paraded into the ring for two classes of therapeutic riding, the same ring in which many Olympic and world champions compete. These riders, like every other participant at the Pennsylvania National Horse Show, had to qualify in order to be invited to show. They qualified by participating in any one of three qualifying competitions held around the state this summer. All riders who met the qualifying requirements were invited to ride at the Pennsylvania National Horse Show. For the Championship, two classes were held, Walk/Trot Assisted and Walk/Trot Unassisted. The riders were judged on their equitation, with Judge Louise Serio looking at their position and how they communicate with their horse. Winning the Walk/Trot Assisted Class was Charles Turnbaugh of Newville, PA, riding Mister Sneedercise in western tack and attire. Second place was Gabrielle Arce of Shermans Dale, PA, on Lucy. Lucas Flick from York, PA, rode Peponitas Top Smoke to take third place. Fourth place went to Allen Schlasta, Mount Wolf, PA, aboard She's My Lucky Charm. The fifth place ribbon went to Jordan Witt, Red Lion, PA, and Hot C Zippo. Sixth place was Alexander Lantz of Shrewsbury, PA, with Cinderella's Glass Slipper. In seventh place was Baylee Gilson from Spring Grove, PA, riding He's My Fancy Hobby, and eighth place was Brooke Castriota from New Freedom, PA, with ZTF Toby's Sandy. The Walk/Trot Unassisted class winner was Rhiannon Calp who rode Rio to victory. Second place went to Grace Strayer from York, PA, on She's My Lucky Charm. Third place was Ariana Garde, also from York, PA, who rode He's My Fancy Hobby. The fourth place finisher was Emily Lipsitz, Dover, PA, who rode Peponitas Top Smoke. Fifth place went to Allison Lander from Seven Valley, PA, on Cinderella's Glass Slipper and sixth lace was Alex Petrosky, York, PA, on Hot C Zippo. For the first time the Pennsylvania National Horse Show Foundation honored, as Therapeutic Horse of the Year, Clyde. Clyde calls Pegasus Therapeutic Riding Academy in Philadelphia, PA, home, and for the past 17 years has been a major part of their therapeutic program. Through his patience, kindness and unflappable temperament, numerous children have experienced the benefits that can be gained through equine assisted therapy. The PNHS Foundation proudly presented Clyde with the very first Therapy Horse of the Year Award as part of the Pennsylvania National Horse Show.